Knowing how buildings work inside is a key to better understanding where energy consumption comes. In this article, you’ll learn about the types of offices and buildings that banks have today, and how bank offices consume energy. Central or Corporate Offices: they are the largest buildings in the bank. There may be a head office and another operating headquarters. For example, Banco Santander’s head office is in Santander (Cantabria), while its operating headquarters is the famous Banco Santander Financial City, just outside Madrid. Branches and traditional bank offices: they are the classic customer service offices that we all know. These premises are usually divided into a customer service area (with counters and desks) and another area for files and maintenance equipment. Diaphanous spaces, more open, without counters. With special offices, for a personalised service. With digital communication supports: elements such as tablets with which the client can interact, or touch screens for finding information. New generations of ATMs: adapted to new user behaviours, more autonomous. For example, they incorporate contactless reading of cards, mobiles and wearable devices. A new approach to the role of the offices: they go from being an operations centre to being advisory centres. An example of these new bank offices models are the so-called “Store Branches” of la Caixa. Another example, which is very famous in the United Kingdom, is the “Flagship Branch” of the British bank Barclays. Air conditioning systems (HVAC, by its acronym, which are very common in the energy sector). Both fans and air conditioning or climate systems. They are one of the office systems that can produce more consumption peaks since they depend on the season of the year and the variation in the outside temperature. Lighting systems: the productivity and comfort of building users depend on this, as well as a significant proportion of the energy cost. It must also be taken into account that it must comply with regulations related to occupational risks and health of employees (in the case of UK, regulated in HSW). Work equipment: computers, monitors, touch screens, ATMs, electronic equipment such as tablets, mobile phones, etc. Automation systems: one thing that is completely normal in any bank building is the use of building automation technologies, known as BMS or BAS. Security systems: cameras, access control, alarms, etc. Source: “Caracterización del consumo de energía y potencial de ahorro energético en el sector bancario español”. These coincide with the energy data with which DEXMA has consumption in its database. The graph shows that the air-conditioning and lighting systems are responsible for 50-90% of the energy consumption in the branches. This translated into monetary terms, according to the example studied by Pilar Andrés Bailón, would be between 4,300 and 12,100 €/year. Of course, this is a concrete example and these numbers will vary depending on the characteristics of each office and its geographical location. But it gives us a global view of how bank branches consume. 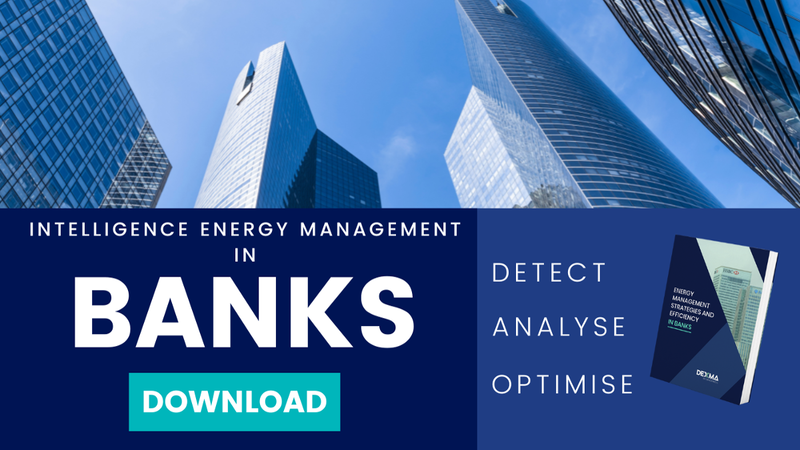 And now that you know better how bank branches work and consume energy, continue to advance your learning about energy and its management in banks with the guide “Energy Management and Efficiency for Banks”. In this pdf, you will have much more information on this subject. Download it by clicking below!